There’s an old, overly-used adage that claims “if you fail to plan, you plan to fail.” But if I’m honest, I make plans all the time and frequently fail. Nonetheless, I keep planning. I set high goals, and even though I rarely achieve them, I do achieve something. And so I plan and plan, all the while knowing I have no idea what tomorrow will bring. 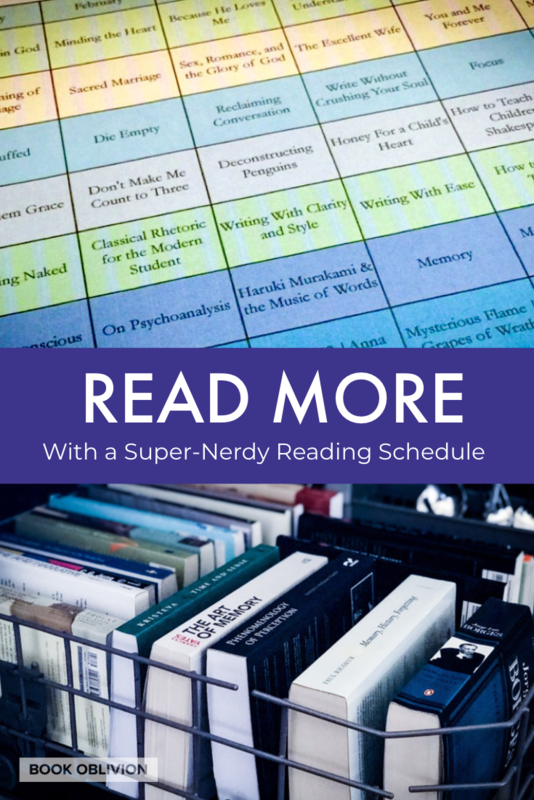 So I’ve mentioned my super nerdy book reading schedule a few times in my comments to readers. It’s usually after someone recommends a book and I reply that book is on my schedule for April, or something like that. Today I will break down exactly what it is. Hopefully it will help you make your book reading goals a little more concrete this year so that you can actually achieve them. 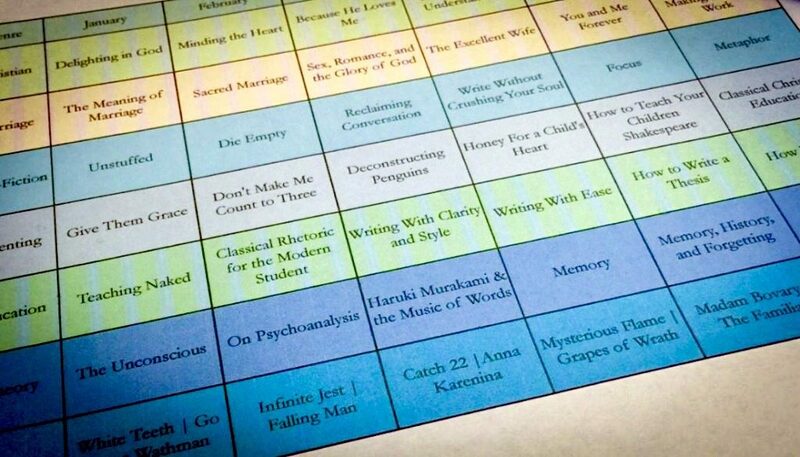 You can snag your own customizable book reading schedule template at the end of this post. I’ve talked a lot about setting reading goals, whether it’s my goal for the year or just reading 30 pages a day. In both cases, I have a lot at stake for achieving my goals, much of which is self-imposed, but still. As a professor of writing and literature, I need to continually grow in knowledge and expertise. That means learning about both writing and teaching, so I have a category designated “Education.” It also means reading classic and contemporary works of literature, so I aim to read 30 pages a day of “Fiction” and preselect the books I will conquer. It also means reading theory and criticism about classic and contemporary works of literature, so I have a category called “Theory” set aside for that. All of these books line up with my current writing and research goals. I tend to reread many works when working on a project. All in all, it’s one crazy-big pile of words. And those are just my professional pursuits. I’m also a wife and a mom, and I haven’t quite mastered either. So every month, I set a goal to read at least one book on each of these subjects. Lately I am reading “Parenting” books about discipline, but last year it was almost always a book on sleep training. More and more, I’m starting to read books about teaching my child to read. Marriage-wise, it’s really healthy for me to realize I don’t have it all figured out, and what’s more, my husband is reading through these books with me, so it’s a really neat way for us to be united as we work through the “Marriage” category. Additionally, I have a category designated as “Non-fiction,” which is where I read books on creativity, time management, current events, or biographies. I review books for a number of publishers, so I plan out which books to read during specific months so that I can write the review in time for the release and all that. This category is also sort of a catch all for whatever books I’m interested in that don’t fit into any of these other categories. Lastly, I’m a child of God. I’m constantly learning about his character and how to love him. I had a crisis of faith a little over a decade ago and read a number of Christian books during that season. Each book helped illuminate different aspects of scripture and different attributes of God. Through the power of the holy spirit, these books helped me when my heart was hard. Since then, I’ve tried to always be reading some kind of book for my soul, in addition to scripture, so I have a category designated for “Christian” books. Just to rehash, I try to read one book from each category and two works of fiction each month. For the works of fiction, I use my 30 pages a day printable. I do this because fiction is the hardest for me to read. I suppose it might be because each work of fiction requires me to create a world in my mind. This kind of architecture is not easy for me, but it’s important to my professional goals that I discipline myself to read some of the best works ever written. At the beginning of December, I took every fiction book off of my shelf that I wanted to read or reread in the new year. I wrote down the number of pages of each and decided what order to read them in. 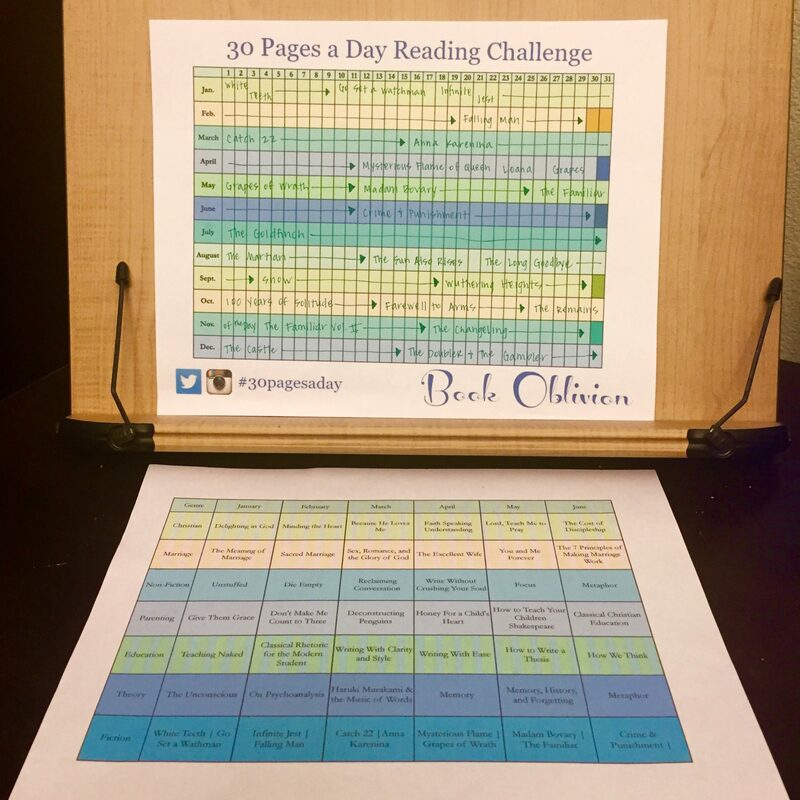 I calculated how many days each book would take and filled in my 30 Pages a Day printable. While I typically read much more than 30 pages a day from books in general, my bare minimum on even my busiest days is to read at least 30 pages a day of fiction. All other reading from different categories is in addition to this. Once again, my super nerdy book reading schedule is a chart I designed to stay disciplined in my personal and professional development. I’ve used it for a little over a year and it seems to work for my brain. How do you stay organized? Would you find this kind of planning helpful? You can snag your own customizable book reading template HERE. I need to get back to reading for myself again. Right now all I read are kid’s books, which is fine because I love inspiring a love of reading in my babies! Yes, do you share tips on inspiring a love for reading on your blog? I want to learn all I can. I’d love to see you feed your own mind again too. I have to get back into reading 30+ pages a day. It’s been a dry spell lately because of situational stuff, but hopefully that will change soon! Great post. Thanks! I feel much more sane when I can balance input (30+ pages) and output (writing, etc.). I’m sending warm book thoughts your way! Thanks, Ixa! It’s included in my How to Read More Course Series if you interested in being a part of that. I would like to use this template. Thanks for sharing!